You are currently browsing the category archive for the ‘Sacred’ category. I continue to be caught up and compelled by the ongoing saga of the Spiral Jetty. It is a touchstone for so many compelling personal themes: the unique power that is an art pilgrimage site (Bilbao, the Ajanta Caves, Uluru in Australia–there are many art/sacred sites that also move me deeply); the geographic connection I feel to the land in Utah and my family’s multi-generational heritage there; the large scale power of Smithson’s construction to frame and define that exquisite desert expanse (not unlike Wallace Stevens’ jar in Tennessee*); the ongoing organic evolution of the structure as the years leave their marks, like the coat of crystallized salt, on the jetty stones. Just to name a few. The Great Salt Lake continues to shrink. Today its official measurement dipped slightly to an elevation of exactly 4,194 feet. The last time it was lower was way back in the 1960s. The lake was at precisely this same level four years ago; then and today, the lowest since record lows in the ‘60s. But this year it’s a real surprise because we had a relatively wet winter. The Great Salt Lake is now surrounded by hundreds of square miles of dried mud and salt. 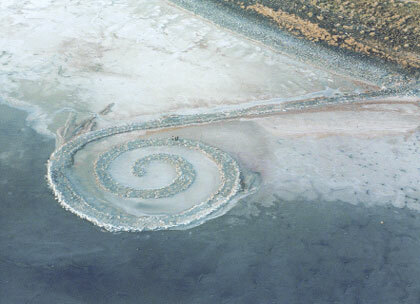 Robert Smithson’s world-famous artwork the Spiral Jetty is now hundreds of yards from the lake it was sculpted in. It still inspires artists. We encountered a man in a suit of mirrors, San Francisco based Austrian Gustav Troger, at the heart of the Spiral Jetty standing on salt instead of water. Lee Sporleder opens the gates at a remote, aging facility on the west side of the lake, a pump house built in the 1980s when the lake was flooding. The $65-million state pumps ran less than two years. The lake is now a dozen miles away across a vast expanse of salt, but the pumps get monthly maintenance in case they’re ever needed again. It would be a long way off, but we’ve got a big investment here, and there’s no sense letting it go to waste,” says Sporleder, with the Department of Water Resources. But you know what they say in Utah. If you don’t like the weather, wait, ah, a few years maybe, and it’ll change. Pretty good odds, eventually the lake will make a comeback. The brine shrimpers worry the saltier water may hurt the shrimp. Duck hunters are afraid the ducks will fly away. For the rest of us, it’s a drama of nature, a lake that defies efforts to control it, whether it goes too high or too low.